After spending the entire summer complaining about the blistering heat (I’m British, it’s what I’m good at), I recently caved and reached for the thermostat, having been left undisturbed for the past seven months. Erstwhile, the leaves are discolouring and dropping; the days are getting shorter, and Oxford Street is already beleaguered by Christmas lights. Autumn has fallen and roast season is upon us. I’ve eaten a few roast dinners over the past month, but none have yet topped that at The Belrose – a fresh restaurant between Belsize Park and Chalk Farm tube stations. 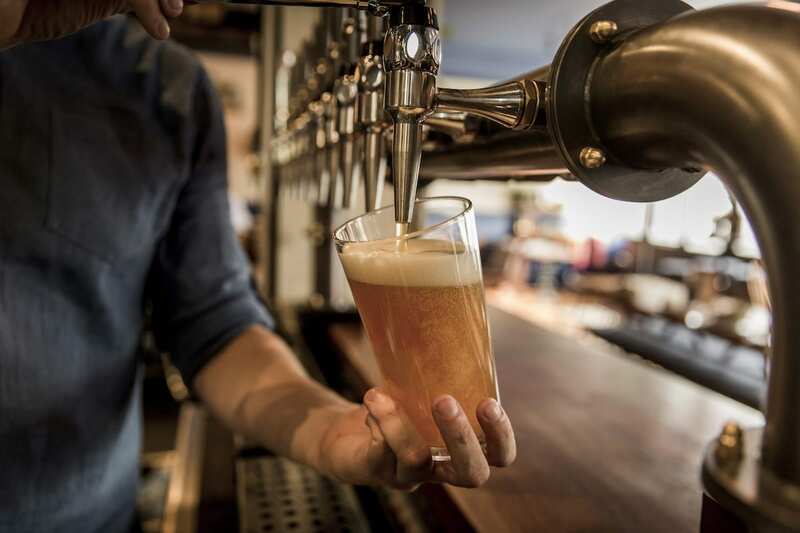 Launched by the group behind Homegrown in Pop Brixton and Casa do Frango in Southwark, The Belrose is the collective’s first pub project, billed as a “modern take on a British pub”. Quietly opened during the summer, the restaurant’s building dates back to the 1860s. Inside, the space is stylishly decorated but endearingly retains many of the site’s local pub charm. Dark blue paint attires the walls and ceiling. 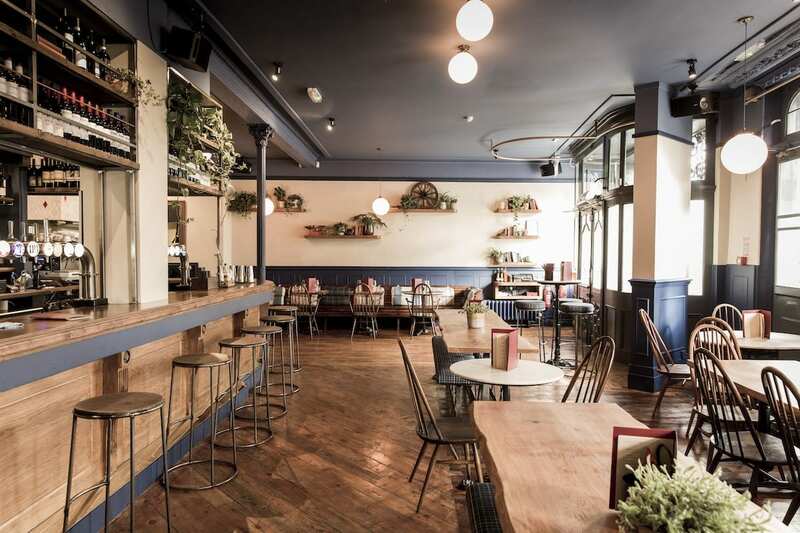 Rough wooden tables are joined by bench seating, while the space is livened by houseplants, globe lighting and a bar with various beers on draught. Pub staples are available on draught, as is The Belrose Pale Ale: brewed onsite and zippy with citrus notes. The room is comfortable, bolstered by splendidly casual, efficient service. It’s reassuring to notice the extensive drinks menu, too, which continues to fly the flag of the classic (albeit contemporarily refined) British pub – brimming with extravagant beers from far-flung nations and breweries still lesser known in the UK. Some beers are exclusive to The Belrose, in the UK. Rhub’ IPA, for instance, is served by the bottle with its Elephant & Castle pink label – a collaboration between French Page 24 and world renowned Nogne O. Brewed with rhubarb, the beer is crisp, acidulous and zippy with notes of its key ingredient, which cuts through the beer’s strong malt character and prevails on the sour finish. In one corner of the restaurant, an open kitchen is placated by a clay pizza oven. Pizzas are served daily alongside an assortment of Italian-inspired dishes. On the dessert menu, a quirky Nutella calzone (£6) utilises the pizza oven, insalubriously decadent and served with silky pistachio ice cream. What’s more, a Sunday lunch menu has also just launched – appropriate given The Belrose’s pub setting. Exact origins of the nationally-adored Sunday roast are unclear, though Britain’s love of roast beef dates back to the reign of King Henry VII, during the 1400s. Each Sunday, the King’s Royal Guard would roast beef over an open fire before attending church. On his return, the meat was cooked and ready for lunch – eventually leading to the noble protectors becoming affectionately known as ‘Beefeaters’. In keeping with tradition, The Belrose serves only roast beef (£18) and a vegetarian nut roast – often regarded as a punishment rather than a nourishing, ethical treat. The theory here is to focus on just one meat and to specialise in doing it well (not well-done, heaven forfend) rather than becoming a Jack of all roast meats. Lunch is quick to arrive at the table, accompanied by a cast iron trough of vegetables. A revolution in cauliflower cheese features florets that are charred before being smothered with molten cheese; while sliced red cabbage is quietly spiced and deeply evocative of Christmas. Peas and carrots are fine, yet the roast beef is the anticipated jewel in the dish’s crown. Slowly roasted for 14 hours, the beef is well-rested and served medium-rare – soft like butter. An optional quenelle of horseradish cream is draped over the beef, lending a classicist whack of decongestant heat. While the large roast potatoes are well-seasoned, the humble veg could benefit from an extra 15 minutes in the oven. The large escorting Yorkshire pudding, however, is practically perfect: airy and gratefully bereft of excess oil, while a dollop of white onion purée is a refreshing touch. Additional gravy, rampant with rich beef stock, is also offered and quickly delivered. While so many pubs focus on serving abominable, Carvery-esque lunches, The Belrose’s offering is neither fussy or pretentious, instead executed with uncommon finesse. The Belrose can be found at 94 Haverstock Hill, London, NW3 2BD.